According to the 1960 August issue of Understanding, Daniel Fry received an honorary degree from the St. Andrews College based in London, England for his work in his book “Steps to the Stars”. To the left is a photocopy of the actual degree (click to enlarge). “ST. ANDREW’S ECUMENICAL UNIVERSITY Intercollegiate Philosophy; theology; divinity; homiletics; psychology; child psychology: psychotherapy; sociology; economics; biochemistry; metaphysics;mental science; homeopathy; languages; literature; and law. Inc. Correspondence. Stonebridge Rd. Tottenham London N. 15, ENGLAND John Dobbs (Adv.) 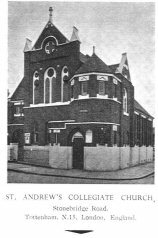 ” A picture of the church to the right shows it in the 1950s. One interesting data point is that the date on the degree is April 26th, 1960 and yet in the first issue of Understanding in January 1960, it lists Daniel as “Dr. Daniel W. Fry”. The previous issue, December 1959, did not. This suggests that Daniel was expecting the degree. 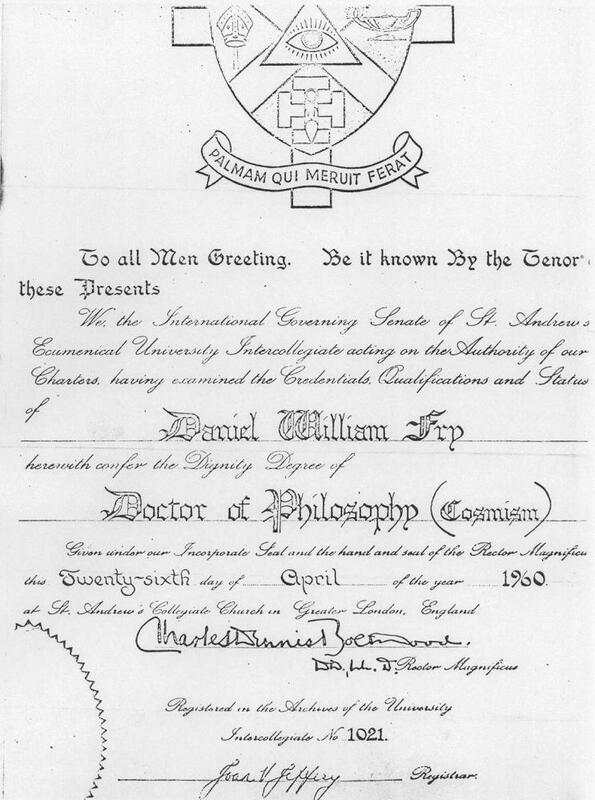 Conclusion: That the institute existed and awarded Daniel a “degree” is certainly not in doubt, however, the question now, is the doctorate valid? The history of the institution makes that claim doubtful.